Bringing the total number of Pokémon from 493 to 495, two new Pokémon revealed late last week. Many furry fans enjoy the Pokémon franchise, but the revealed characters are of more than average interest to furry fans, as they would appear to be foxes, and one features a semi-anthropomorphic stance in some of the revealed artwork. The two Pokémon were originally revealed in Japenese magazine CoroCoro; however, the images were leaked a few days early. 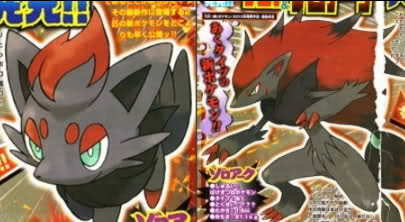 The two Pokémon revealed are Zorua and Zoroark, two Dark type Pokémon. Apparently, Zorua "evolves" into Zoroark; the magazine hinted that yet another new type of evolution would be introduced with these characters. Zoroark will make an appearance in the 13th official Pokémon movie; it is speculated as an antagonist, though for all the speculation it may be just a cameo. Earlier this year, Nintendo revealed that the "fifth generation" Pokémon series will be released sometime this year. Historically, the Pokémon series has released first in Japan, and then gone through a lengthy localization process before coming to North America; it can be assumed that the very tentative release period would only extend to Japan. American gamers will probably have to wait until 2011. Looks nothing like a focks.